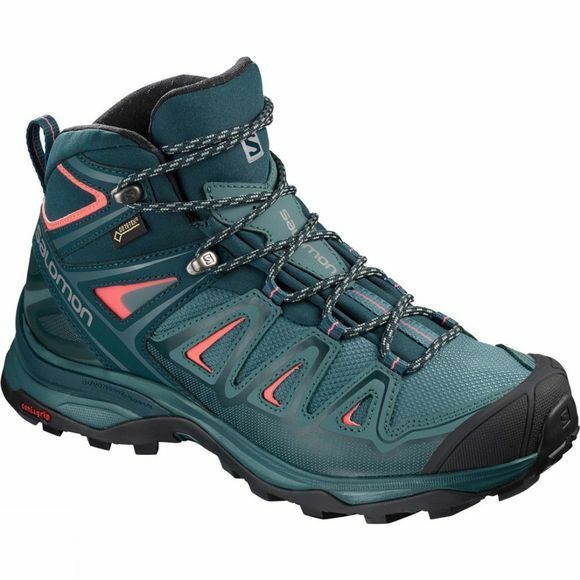 The Women's X-Ultra Mid 3 GTX Boot from Salomon has been tweaked and perfected to create a fantastic lightweight hiking boot that allows you to move at speed, safely through difficult terrain. Perfect for the quick and nimble mountain explorers amongst us, the Sensifit technology really holds your foot in place while the Advanced Chassis provides under foot support, stability and protection. The Decent Control technology allows you maintain excellent grip even when going downhill thanks to the strategically placed rubber and patterned lugs on the heel of the outsole. All the while the GoreTex bootie hidden on the inside of the boot ensures waterproof and breathable protection and helps to keep a dry and healthy environment for your foot on the inside of the boot.